Following the warmest April on record and with the warm, dry weather looking set to continue, London Fire Brigade is urging Londoners to take care. Over the past week hundreds of firefighters have been tackling grass and forest fires across the UK brought on by the hot weather. For the past 24 hours, twenty five of the Brigade’s firefighters have been assisting Royal Berkshire Fire and Rescue Service in fighting a massive blaze in a forest near Ascot. Due to the size of the fire, London Fire Brigade anticipates being at the forest for several days. “People think this couldn’t happen in London but we get called to thousands of grass fires each year. There are a lot of parks in the capital and the risk from grass fires is high as they can spread to nearby buildings. Grass and forest fires account for over one in ten of all fires attended by the Brigade. In the last year alone, London Fire Brigade has attended almost 3000 grass and forest fires. The number of grass fires has shot up - this April there has been a 50% rise in the number of grass fires when compared with last April. Grass fires can spread extremely quickly and pose a huge threat to wildlife, parkland and even people’s lives. 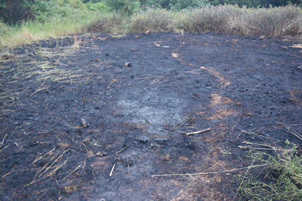 The main causes of accidental grass fires are barbecues, cigarettes, discarded matches and glass bottles, which, when left on dry grass can concentrate the sun’s rays and cause fires. Firefighters advise that barbecues are never left unattended and are completely out after being used. Cigarettes should be carefully disposed of as they can easily ignite dry grass. Firefighters are particularly concerned about drivers who throw lit cigarettes out of car windows as dry grass verges ignite easily. The Brigade advises that if you see a grass fire, you shouldn’t attempt to put it out yourself as grass fires can travel very quickly and change direction without warning. You should call 999 immediately and tell the Brigade where the fire is.